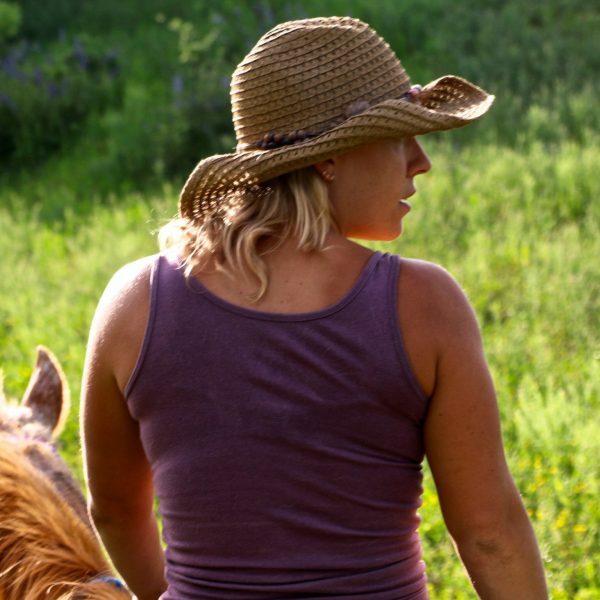 Enjoy the following reflection on yoga and horseback riding. Emily Bolt is a yoga instructor in Austin. She’s going to be supporting our 2017 Horse Camp with yoga classes in a lightly air conditioned room above the barn during the heat of the day. 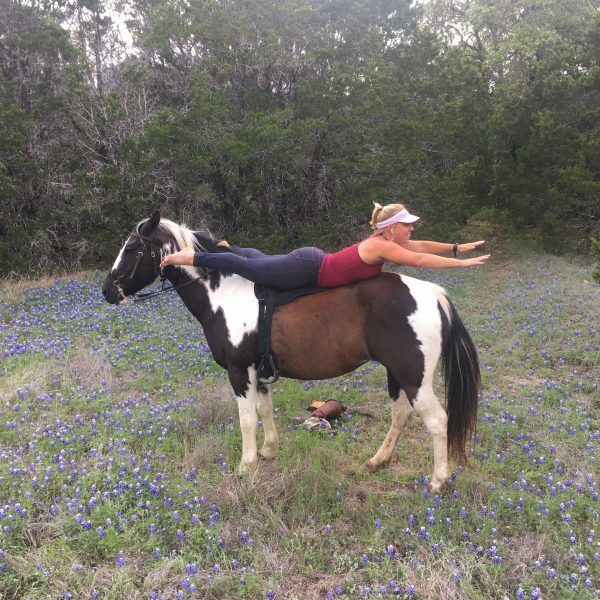 Yoga crosses over with horseback riding in so many ways, and so we are delighted to have Emily contribute to the camp in such a meaningful way. Enjoy! I went back to riding after a long hiatus. I was nervous I wouldn’t remember what to do, or loose control of my horse. As I rode, I realized I was more prepared to be in the saddle than I thought, thanks to all the time I’ve spent on the mat. There’s a fine balance of simultaneous strength relaxation that yoga inspires. There is a delicate and powerful draw to be fully in the present moment. There is the ritual of bringing yourself to a calm state of mind, that can be translated into any situation. As a yoga practitioner and instructor, I cant help but see so much similarity in the practice of yoga and horse back riding. These two art forms are extremely complimentary and mutually beneficial. The practice begins when you enter the space, and roll out the mat or throw on the saddle. It takes the first few minutes to warm-up. In a yoga practice you spend the first few minutes taking deep breathes and turning your awareness inward, setting an intention. In riding, you pet the horse, ordering arcoxia look it in the eye and tune in. While riding I felt my mind tuning into my body awareness, feeling my toes lift, the subtle gesture of my hands, I was pulled into the present moment. While, taking in the beautiful scenery and trusting this large majestic animal going up and down hills, and romping through the river, so many emotions arose. At times I felt nervous, and noticed myself tense up. I was so grateful that I had the practice of deep breathes to calm and center my body. It really helped me be a more confident rider. As I sat on the saddle, riding over rough terrain, I became aware of my alignment. I was able to use my so many tools from my yoga practice on my ride. Like sitting tall and elongated my spine and grounding through my sit bones to find balance and ease while riding. Like calming down my nervous system with breathing techniques and being mindful. After the ride, just like after a great yoga class, I felt energized, empowered, and at peace. I cant wait to grab my mat, saddle up, and see where it takes me. 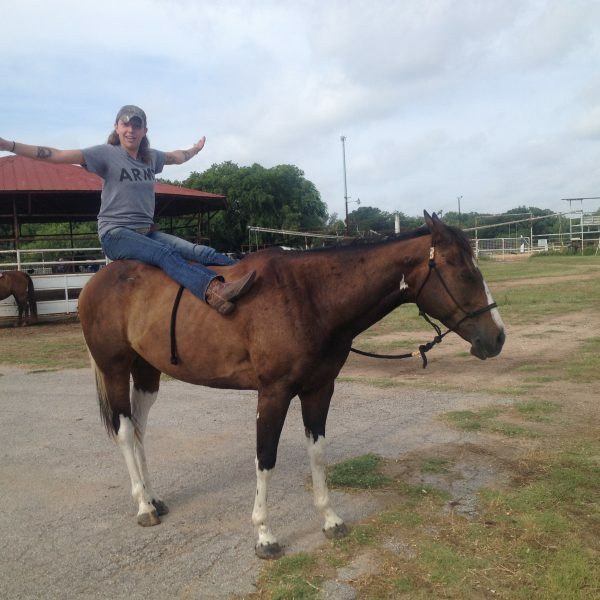 The reality is, yoga helps horseback riders. And horseback riding helps yogis. We can’t wait to share this empowering practice with your children. Our 2017 summer campers are going to get a full horse experience this year, and yoga is thankfully a part of that experience. Thanks for sharing, Emily.